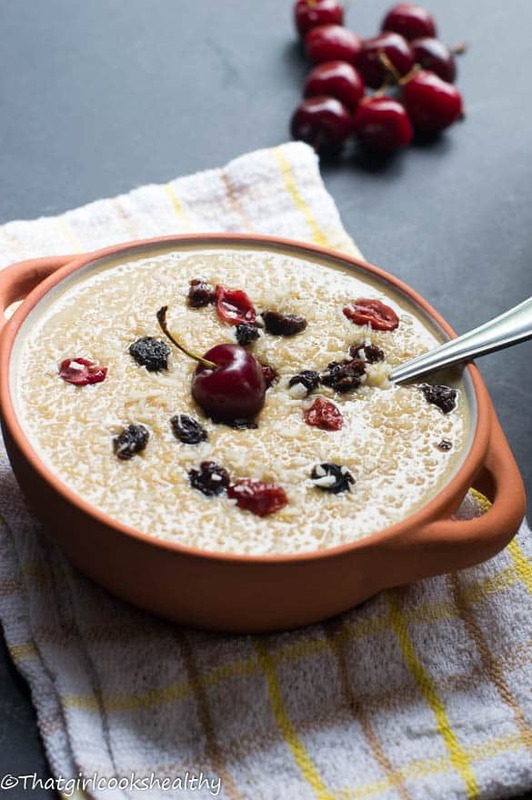 Quinoa pudding recipe – move over rice pudding, this tasty dessert is made with plant based milk, pseudo grain quinoa and topped with fruit. Quinoa pudding? Things just got awesome up in here with my latest recipe. I couldn’t wait any longer with dropping this badboy I seriously want everyone to know how fantastic this recipe truly is, excuse my arrogance, no scrap that I’m a proud cook. I’m a sucker for some rice pudding namely because I ate it a lot during my youth. Nowadays I seldom eat grains in fact I don’t really consume grains as much as I did before, with so many alternatives out there. One of my favourite ways to channel some of my recipes from past is using quinoa (pronounced Kween wah). Quinoa is a pseudograin, hailing from the beautiful south America, just like chia seeds. Quinoa? Is it a seed or a grain? Presently the verdict is still out with this pseudo grain, some classify it as a seed which behaves like a grain while others disregard the great pseudo debate and consider quinoa a seed. Whatever the case the good news is this edible seed is wheat free and a perfect rice alternative hence how I stumbleupon this recipe. 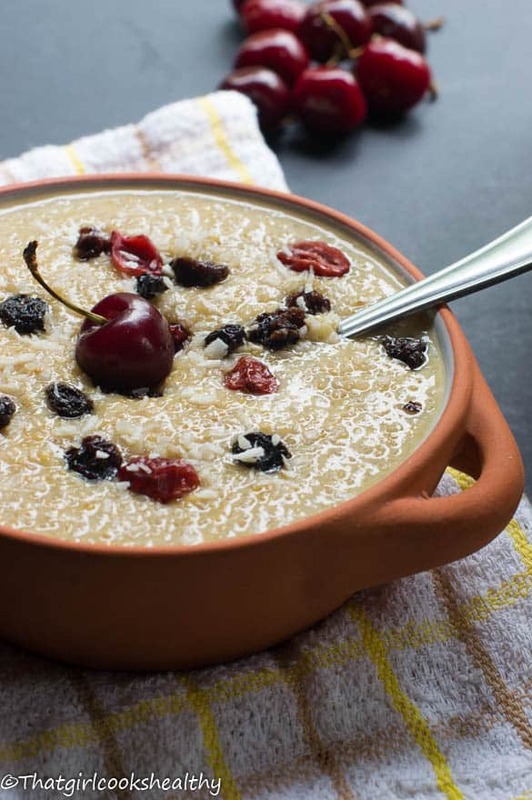 The fact that quinoa is loaded with a high amount of protein, fibre and resistant starch provides you with a good source of energy and something you’ll want to include in a high protein diet. Believe me when paired some coconut milk and coconut nectar, the slow metabolic process really helps with keeping you fuller for longer. Here’s a tip to take note of, make sure to soak the seeds prior to cooking to get rid of the starch and subtle bitterness. I learnt the hard way, although the bitterness is fairly subtle, I do recommend pre-soaking/rinsing. Once the seeds have been soaked the rest is very simple, it’s merely a case of adding all of the ingredients to the pot to boil then reduce to a summer for 25-30minutes. Half way through the seeds will begin to change to a transparent colour and swell. Don’t forget to add some fruit, nuts and seeds to top it off. Start by soaking the quinoa in lukewarm water for 20 minutes then rinse and drain. Combine all of the ingredients into a medium sized saucepan and bring to the boil. Allow to simmer for 30 minutes, stirring frequently throughout the given time. 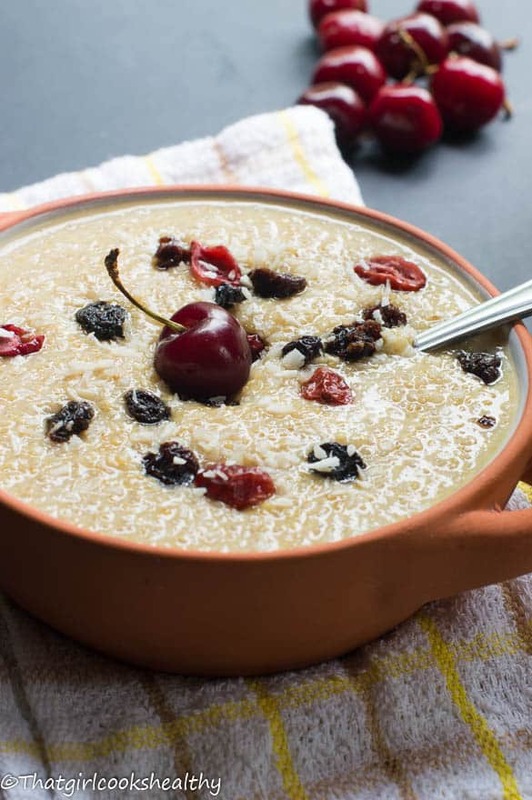 20-25 minutes during simmering the quinoa will begin to swell and absorb the milk, turning a thick porridge texture. When the quinoa has thicken and turned transparent serve and add your favourite fruit. I should, however, mention that while you are ABSOLUTELY right that quinoa is a seed and not a grain, it is not paleo. I hope you take off the paleo tag because it is misleading. 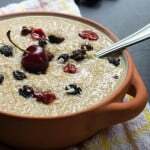 Hi Sophie, thanks for commenting I was actually hesitant about whether or not I should add the paleo tag because there seems to be a great debate surrounding quinoa, while it doesn’t form part of the paleo regime, I know a few like to consume this, while adhering to the paleo lifestyle. I personally don’t consider quinoa paleo friendly because it acts like a grain but still like to acknowledge the small pool of people who do eat it. I think it might be best if I draw some clarity on this in my post as I certainly do not want to mislead anyone or worse still ill inform them. The fact that people who follow the paleo diet consume quinoa doesn’t make quinoa part of the paleo diet. Many paleo-ers also consume rice – but that doesn’t make rice paleo. I have removed the tag and modified the content to suit so there is no misrepresentation of the recipe/paleo lifstyle. Thank you for commenting, do I just post the link on your page by Friday? Sorry I haven’t contributed to a link party before, so not exactly sure what to do? Looks delicious and healthy.. I have been looking for quinoa recipes forever.. this looks absolutely yummy. Thank you.It’s such a great replica of rice pudding. 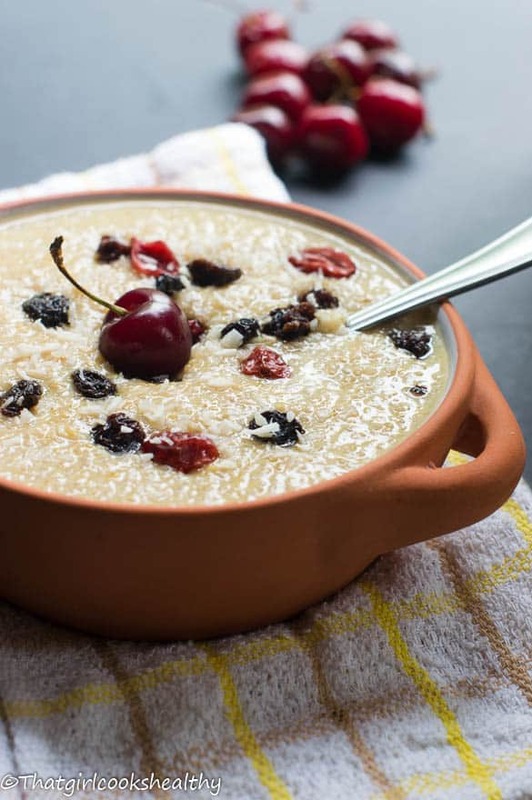 If you’re a fan of rice pudding then you’ll definitely like this one. Tinned coconut milk contains unwanted additives and preservatives. I would highly recommend making your own and keeping it on rotation, please refer to my homemade coconut milk recipe for nut milk that’s more unadulterated and pure. Do you use canned coconut milk? Or the carton (SoDelicious brand) that you find in the dairy section of market? I always wonder that when I come across recipes with milk alternatives since there are so many in the marketplace right now. Hi Cindy, I totally forgot to mention the type of coconut milk I used for this particular recipe. I used home made coconut, you can find the recipe for it right here Usually If I use canned coconut milk, I will state that in the post. I hope that helps and let me know if you need any further assistance.